Inspired by new crime classics like Ed Brubaker’s Fatale and Darwyn Cooke’s Parker series, writer Anthony Del Col (Assassin’s Creed, Kill Shakespeare) and artist Werther Dell’Edera (Batman: Detective Comics, House of Mystery) bring the iconic teen detectives into the modern age, and redefine noir for a new generation of readers! Frank and Joe Hardy have lived their entire lives in the seaside New England town of Bayport. Life was great: their father was a chief detective with the Bayport Police Department, their mother ran her own successful little online business, and they were popular with their peers. As far as teenage years go, theirs were shaping up to be among the best. 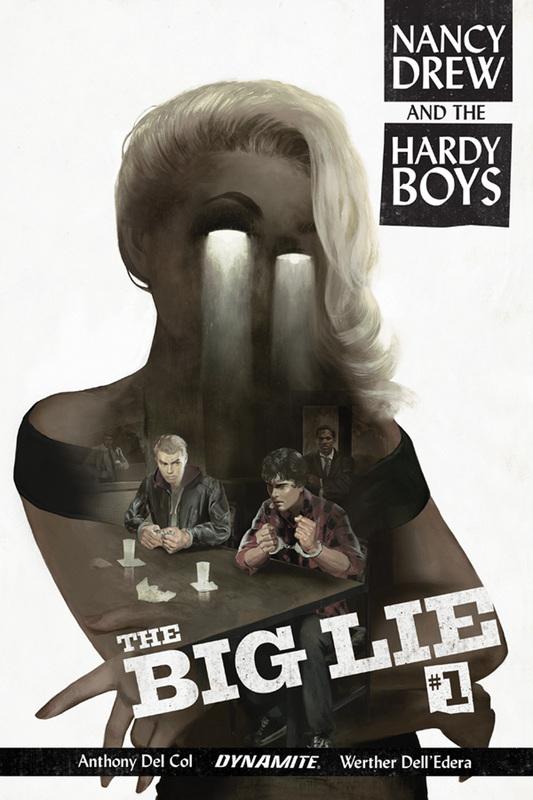 That is, until their father is accused of corruption and murdered, leaving Frank and Joe stand as the prime suspects. Now it’s up to these two teenaged super-sleuths to get to the bottom of this, their biggest mystery and their greatest challenge. If I had to point at any single thing that stood out as Dynamite’s specialty, it would have to be in the way it takes old characters and brings them back to life. They’ve had a great track record with pulp heroes like The Phantom, The Shadow, and the Green Hornet. 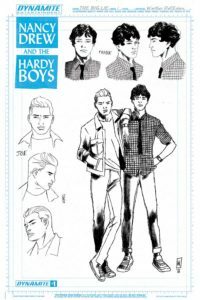 Now they’re tackling a classic young adult mystery series that’s been around in one incarnation or another, the Hardy Boys. The series has always followed the adventures and misadventures of Frank and Joe, two bright and inventive young lads as they set about breaking cases and solving puzzles that leave their adult counterparts dazed and confused. 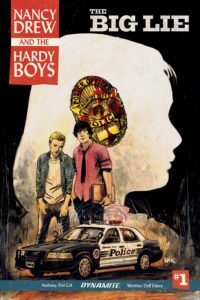 Always wholesome and respectful of authority, the Hardy Boys have stayed a step ahead of criminals everywhere. But what if we took those smooth, rounded edges, and ground them down so they had more of an edge? That’s what Dynamite’s done, with the help of Anthony Del Col, Werther Dell’Edera, and the rest of the creative team. In this iteration, the Hardy Boys are a little more dysfunctional, and a little more arrogant in their intellectual superiority. What’s more, where the sibling bond between Frank and Joe has traditionally been unshakable, here we see them at odds with each other… Even to the point of getting into a fist fight! What on earth could have taken these two bastions of wholesome juvenile antics and turned them into combative murder suspects? 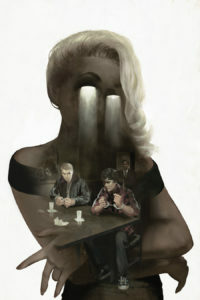 In a great nod to the pulp noir detective stories given tribute on both the cover and in the story itself, it all comes down to “a dame”. But what is the identity of this mysterious femme fatale? Well, not to give it all away, but her name is right there in the title of the book… it was kind of a giveaway. How the infamous Nancy Drew ties into the story, however, is the true mystery to be solved. Oh, and that murder mystery thing… I’m sure the boys are eager to get their hands on whoever set their dad up as dirty cop, killed him, and left them to take the blame. Sure, taking a series like the Hardy Boys on as a comic book is a risky thing. 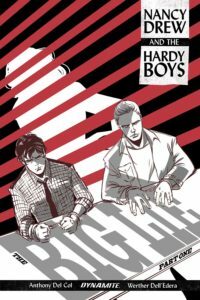 While I’m more than passingly familiar with the pair of brother detectives, having both read many of the books and watched the television show as a kid, others may not have any idea who they are. 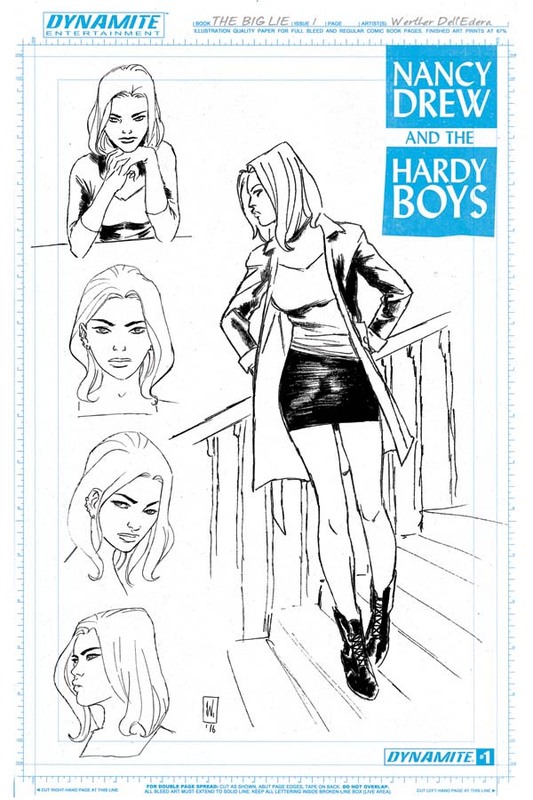 Further, the idea of a trio of juvenile super-sleuths may not be the kind of comic book that would attract some readers. At the risk of sounding like I’m just floundering in a wave of out of control nostalgia, I would like to relieve some of those doubts. This is a very well-crafted story, bringing the touch of darkness that was lacking in the Hardy’s earlier years. Not to put too fine a point on it, but when being interrogated by the police, they really are a pair of wise assed little shits. Del Col has done a great job of scripting some entertaining dialogue, and giving the story a good pace… not too fast, as the plot moves forward into a gradual reveal at the end of the first issue. The writing is bolstered by the art and colors by Dell’Edera & Simeone as they start out showing a style reminiscent of comics from the forties and fifties, and then evolving into a more modern look. For a book that’s based in a more or less “real world”, not something that always translates well into comics, the artistic team did a great job of keeping the characters and their world interesting and dynamic through the use of “camera angles”, framing, and cutaways. Honestly, I can’t really find a fault in this title. Dynamite and company have taken something old, some might say “dated”, and turned out a pretty solid premier issue. Fans of murder mystery tinged with a touch of conspiracy should give this one a look. Frank, Joe, and Nancy are off to a great start.